Description: Popular game from Cheapass, which specializes in quick games with very cheap components. Players are expected to supply the usual gaming stuff, dice, markers etc, Cheapass supplies the rest with a large dollop of humor. 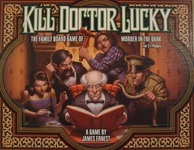 In this notorious game, players move around the mansion trying to murder Dr Lucky without being seen. An inversion of Clue. In the Cheapass game Save Doctor Lucky the goal is to prevent Dr. Lucky from drowning.